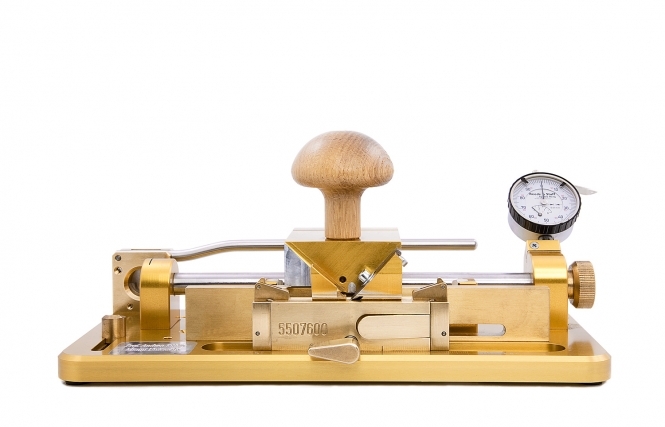 The Reeds ‘n Stuff gouging machine is the ultimate machine for gouging your cane. 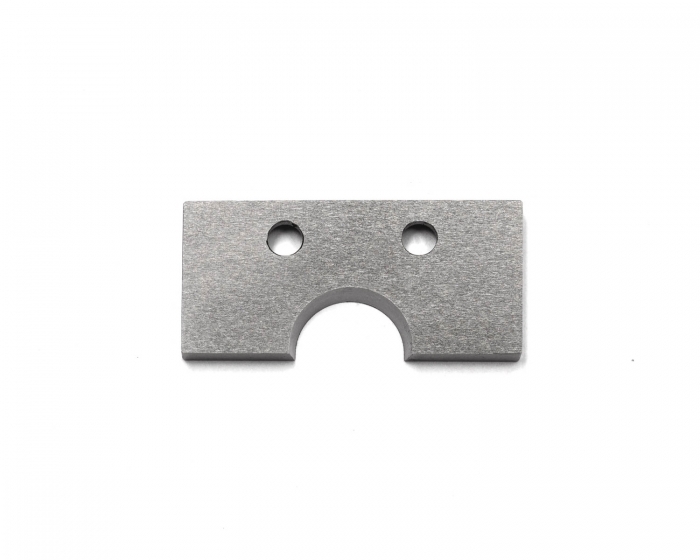 Its newly designed cylindrical blade provides the most accurate cuts and a perfectly smooth surface. And an ingenious thickness adjustment keeps the blade centred at any settings.Forget all the problems you have heard about the old gouging machines. Changing the blades is now very easy, anyone can do it! 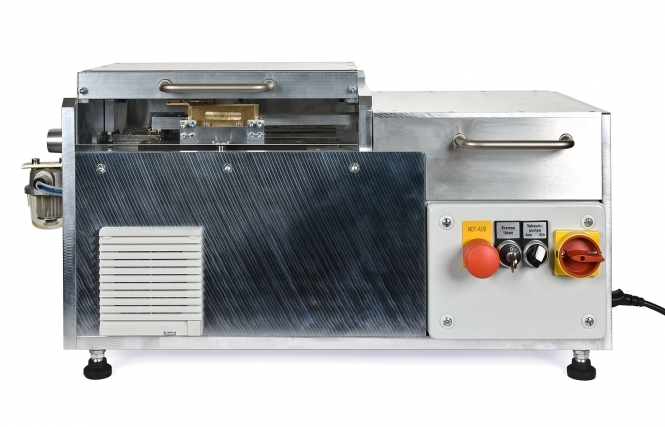 No need to send the machine to a mechanic or back to the factory for adjustment - no more trouble after sharpening the blades. Variety of bases and blades. 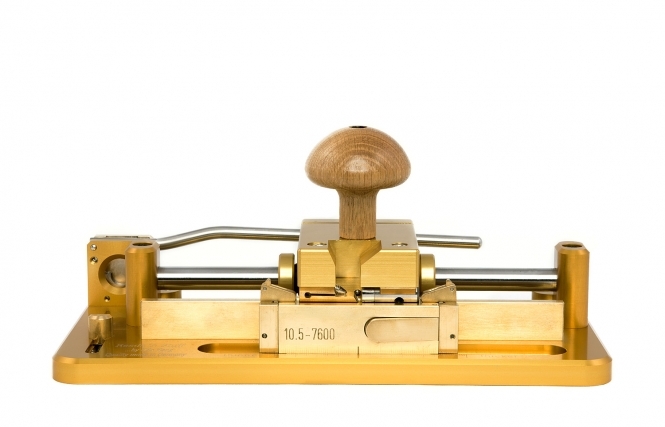 You can choose from a wide variety of bases and blades to gouge to the diameter of your choice, making the one machine for Oboe, Oboe d’amore, English horn and Baroque Oboes. Available in diameters Ø 10 / 10.5 / 11 / EH or Baroque Oboe. 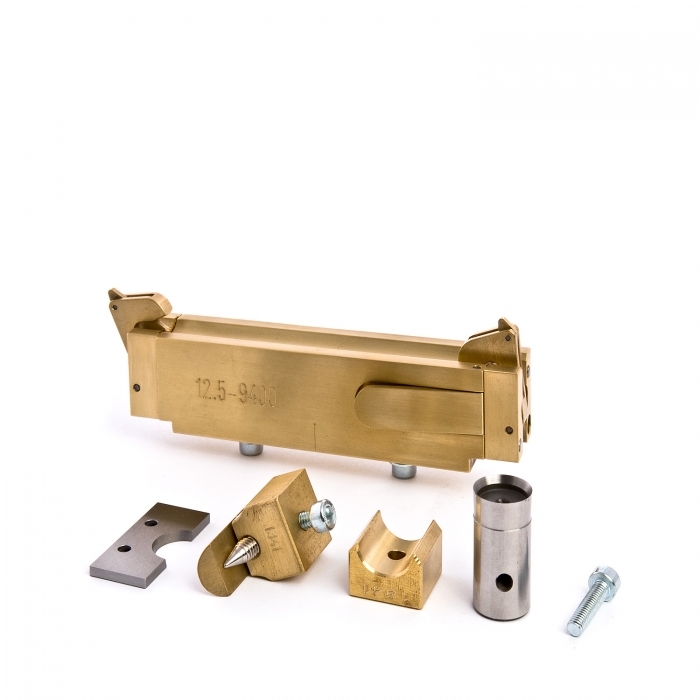 Available only in diameters 10; 10,5; 11; 12; 12,5 and 15 mm. Exchange beds in diameters 10; 10,5; 10,7T; 11; 12; 12,5; 13; 14; 15 and 16 mm. 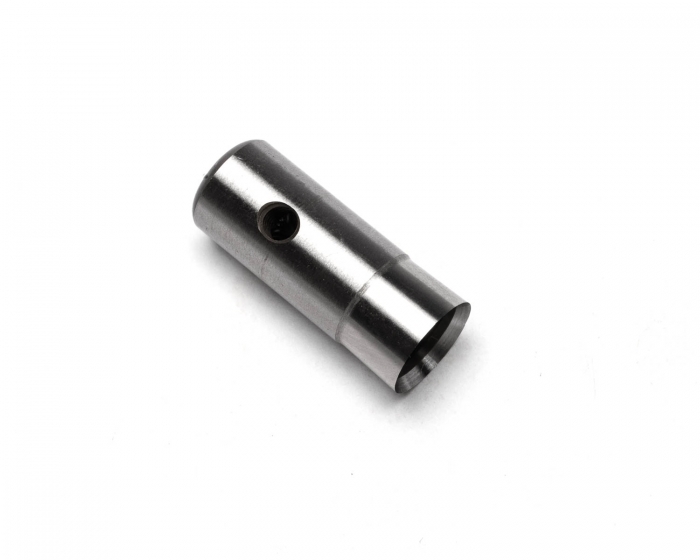 Available only in 11 mm diameter. Exchange beds in diameters 10; 10,5; 10,7T; 11; 12; 12,5; 13; 14; 15 and 16 mm. Traditional German Gouging machine blades. Patented cylindrical blades. An American style elliptical blade. Centered gouge Centered gouge is factory-preset. Machine has an adjustment for W-gouge. Centered gouge is factory-preset. 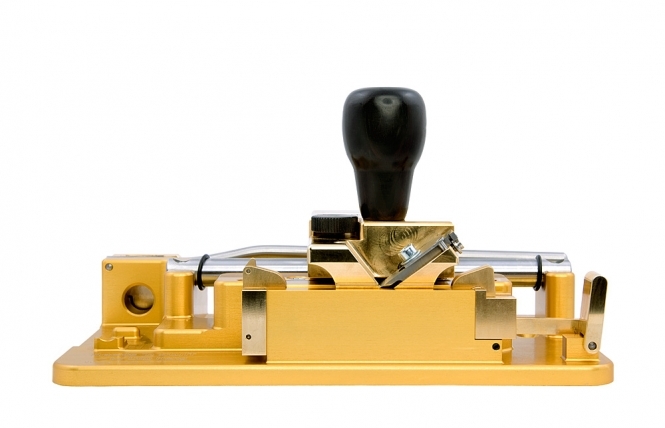 Machine has an adjustment for W-gouge. 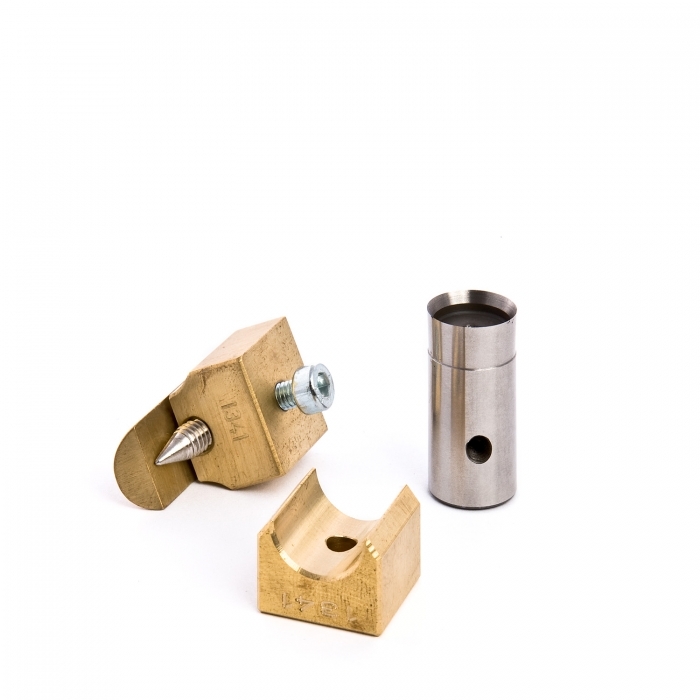 Built-in precision system for adjusting the center of the gouge plus an attached micrometer. Centered gouge is factory-preset. The right gouge is the heart of making a good reed. This gouging machine ha transformed my reedmaking with its accuracy and simplicity of use. I wish I had owned one years ago! Thank you for the excellent machine I received. I tested it for the week and have now installed it at the Royal Northern College of Music. It works beautifully and very reliable. I would recommend your machine very strongly to anyone looking for a new machine. I have had my english horn gouger for three months now and i just want to tell you how pleased Iam with it. I had two gougers before and I feel I don't really know a lot about gouging but your machine makes things so easy. I have had a lot of good reeds from this gouger like never before. The machine is quite impressive too; the blade is astounding. I am writing to you, firstly to thank you for all the machines. I have purchase from you over the last few years. I first bought a Reeds n Stuff Gouging machine in 1999/2000 and since then invested in your Reed Tip Cutter, Pregouging Machine and Profile Machine. Now I looking forward to my Reeds n Stuff Shaper Machine which will definately help me to save even more time. I have found the Reed tip Cutter tobe an essential tool I would never manage without! Many thanks. 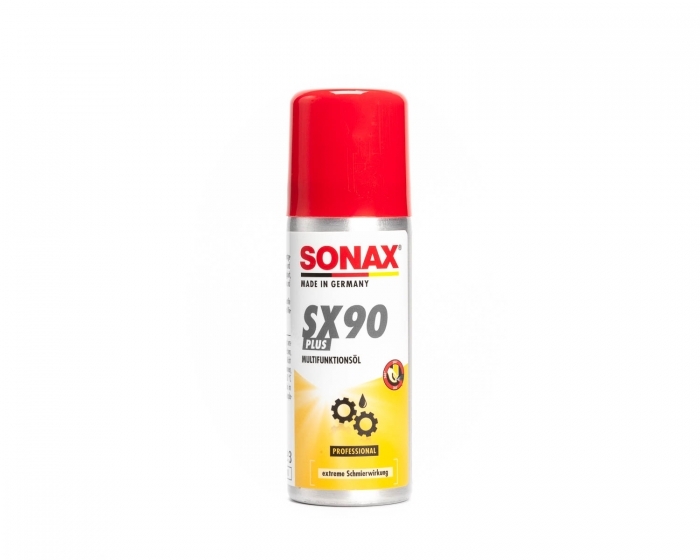 Ich wollt mich mal melden und sagen, dass die Maschine also angekommen ist und Ihnen sagen, dass ich äusserst zufrieden bin!! Ganz toll, habe eine ganze Reihe von Hölzern gehobelt und die Rohr- Ergebnisse sind wirklich erstklassig!! Freue mich sehr! Nicht nur die Ergebnisse überzeugen mich sehr, sondern ziemlich intelligent und pragmatisch finde ich auch das ganze System in dem die Maschine konzipiert ist, was Dickenverstellung, Messerdrehen und natürlich die Option des Austauschens des Bettes angeht. Vielen Dank!! !